When it comes to mens suits, you'll find that the designer brands we carry have the fashion oriented man in mind who dresses to impress and likes to wear Stacy Adams Shoes and Zoot Suits to match. Designer Mens suits aren't just something you wear but are a reflection of who you are and what you want to be. You will find that the designer brands of mens suits we carry will suit most men who appreciate looking their best whether it's classy style or high fashion style suits with a full cut and wide leg pants. If you love Our Mens Dress Suits and Linen Suits for Men you'll love our collection of alligator shoes. Checkout our Huge Collection of Urban Men Suits Here. Find some great looking Cheap Suits and Mens Blazers here that are well made. Find a Dinner Jacket that suits your style. Steve Harvey suits have cutting edge style that is simply not for the boardroom. They are very stylish and not conservative. Steve Harvey Suits are made of fine fabrics and are impeccably stitched. Steve Harvey suits have become a fashion suit synonym sort of the way Kleenex has become a name for tissues. Pretty much any men's fashion suit featuring a full cut jacket with different fashion features is referred to as a Steve Harvey Suit. Men's Falcone Suits have been at the Forefront of New York style Men's Dress Suit and Zoot Suit Fashion for over 100 years. Falcone Suits are Simply the Cutting Edge of Designer Style. If you are the type of discerning man who simply craves a fashionable designer suit, Falcone suits are the way to go. Men's Suits by Falcone are not for fashionably timid man. It takes much bravado and flair to dress flashy. When Your style is all about making a Statement and You like to dress to impress in Italian Wool fashion suits, Statement Suits is the brand that will make that happen. You'll find that the selection of styles and fabric patterns that Statements makes will be to Your liking and keeping Your style on Top. 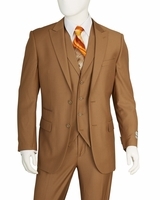 Statement specializes in both suits and Tuxedo Alternative Suits. Tiglio suits combine fine Italian wool and design into stylish wide leg suits that are a cut above the rest. Their luxurious Italian wool fabrics immediately get recognizes as a luxury item that you want to be seen wearing. You'll find their collection of wide leg wool suits pleasing to eye as well as comfortable. Vittorio St. Angelo specializes in both traditional style Mens Suits as well as full cut Mens Fashion Suits for the fashion forward Man. Vittorio St. Angelo Suits are inexpensive priced Mens Suits that are well made and Italian design and attitude at a reasonable price using quality construction and tailoring. You simply can't go wrong purchasing a Vittorio St. Angelo Suit. Give your retro side a fashion lift by wearing Tony Blake suits. Tony Blake suits reflect a fashion mindset that will remind you of the era when all well dressed men wore suits and hats. We're talking about 1920s, 1930s and 1940s when you could see most men wearing suits. That is what Tony Blake is all about. Ferrecci knows all about fashion suits and why You like to wear them. It's about bringing the noise when You enter that party room. You want to make a grand entrance and have all eyes on You. These fashion suits are designed in Italy with a Retro 1930s style ready to make the party jump.